How does the self-proclaimed “King of R&B” celebrate his 25th birthday??? By throwing down $40,000 for a lavish dinner party at a high-end steakhouse!!! 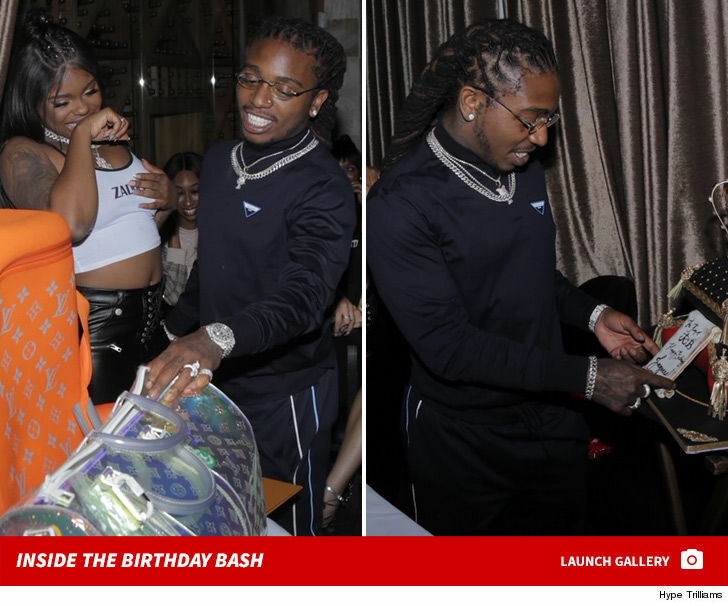 Jacquees ﻿pulled out all the stops Monday night for his bday bash … renting out a private room on the first floor of Mastro’s in Bev Hills and hosting dozens of his closest friends for a banquet fit for a king. Jacquees was lording over the dinner table as he chowed down on oysters, king crab legs and steaks … washing it down with Ace of Spades and Hennessy. In true royal extravagance, Jacquees and his pals sampled every single appetizer on the menu!!! As you can see, Jacquees kept the king theme going for his custom bday cakes … swapping out candles for a crown on one, and slapping an image of him wearing a crown on another. Jacquees dropped a fat bag celebrating himself, but he also secured a couple too … his rapper girlfriend, Dreezy, gave him a huge Louis Vuitton bag and his manager, Johnathan, gave him a slightly smaller version. The feast started at 8 PM and didn’t end until 1 AM … Jacquees and co. were having so much fun, they kept the staff working an hour overtime to keep the party going. Actress Lala Milan and singer Sevyn Streeter were among the guests … and Jacquees got special bday video messages from Ty Dolla $ign, Chris Brown and Birdman.